According to Indian custom, in order for a young boy to successfully become a man, he would have to go through a series of events known simply as a vision quest. If the young boy successfully did this, he would in so many words, become a man in his tribe’s eyes. In our society, a vision quest towards manhood means being legally able to drink. For three days, yours truly embarked on a journey to search for the meaning of life, using $250 (thank you, Mom for teaching me about saving money), blessings from my main man Matt, and the grace of God (not Grace Walker, who as I write this is in England). During this sports-related journey for the meaning of life, I ran across many interesting characters, including TNB’s possible answer to Erin Andrews. Wednesday, March 12th- Until the realignment in 2005, the Conference USA Tournament was a tournament that the Memphis Tigers could not win. In fact, the Tigers’ last conference tournament title before 2005-06 was the 1987 Metro Conference Tournament during Larry Finch’s first year as head coach. 21 years later, the Tigers entered Wednesday on the verge of winning their third straight conference tournament championship, the first time that had ever happened in the history of the program. 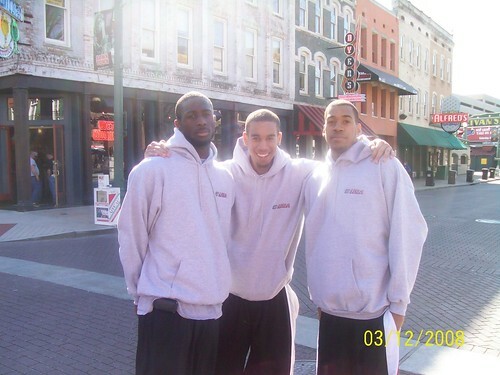 However on this day, I spent 90 minutes walking up and down Beale Street looking for fans or players from schools other than Memphis, only to come across a trio of players from perennial C-USA doormat East Carolina. One of the joys of being a sports fan in Memphis is the fact that scalping, which is normally frowned upon in most cities, is actually legal only if you don’t in front of the venue the event is taking place in. And given the fact that I am a college student, I decided to buy tickets from a scalper across the street from the FedEx Forum, trying my luck at finding a seat that wasn’t in the nosebleed section (otherwise known as the terrace level). And lo and behold, I succeeded, finding Plaza level tickets for Thursday afternoon’s session for a low price of $20, $10 below the actual price, something that seemed to annoy the scalper I was dealing with. Thursday, March 13th-Entering the 13th, I believed that the Blazers would join the Tigers in the Big Dance because of their solid RPI, their second-place finish in Conference USA, the fact that they nearly beat Memphis in Bumpkinham, and they beat Kentucky in Louisville. However, that was not the case as I sat in the Plaza level of the FedEx Forum, snapping pictures and talking with an elderly couple on why Memphis should root for Tulsa. For much of the time as I sat talking to the elderly couple, I actually figured that UAB, which had more athleticism and talent, could beat the Golden Hurricane and then coast to the finals and have a close game with the Tigers. But it was not to be as the Golden Hurricane burst the Blazers’ NCAA bubble with a convincing 78-68 win in overtime behind the outstanding play of guard Brett McDade and big man Jeremy Jordan, who scored 23 points for the Golden Hurricane. 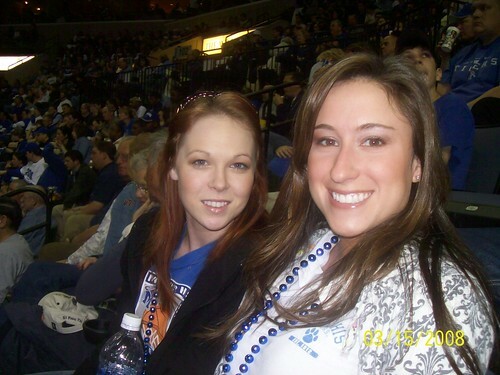 Saturday, March 15th-Sometimes, life can throw you a curveball in the form of a female sports fan, especially if she’s a fan of the same team you grew up rooting for. But when it’s in the middle of a bidding war for tickets from scalpers, then that’s when you have to question the worthiness of it. At the same time this was going on, I spotted an attractive young lady wearing a University of Memphis shirt across the street and heading into Starbucks. After ordering the same thing the girl had and exchanging phone numbers, I then brought up the possibility of her writing for this very blog you are reading now, giving us an opportunity to have our own version of Erin Andrews. As of this writing, nothing has been set in stone as far as her writing for us but hopefully in the coming days, we’ll have our first “Nasty Girl”, pending Matt’s approval. As far as the game was concerned, the Tigers were up by at one point 22 on the Golden Hurricane, who looked to pulling off one of the biggest upsets in their history and in the process making the NCAA Tournament for the first time since 2003. But as it has happened often with many C-USA teams over the last three years, the Golden Hurricane fought the good fight, and still got sucker-punched as the Tigers won their third straight C-USA Tournament title by the score of 77 to 51. Towards the end, I managed to snap another picture, this time some girls who were sitting next to me. Obviously, that picture as well as the performance put on by the Tigers in the Memphis Invitational, was worth a thousand words. And maybe a parade down Beale in a few weeks. This entry was posted on March 19, 2008 at 10:04 AM	and is filed under NCAA Basketball. Tagged: AUTHOR:DOC HANCOCK, Conference USA, Memphis Tigers. You can follow any responses to this entry through the RSS 2.0 feed. Both comments and pings are currently closed. Glad you were able to spend a few days in town. Nice scribble. A ‘meaning of life’ Google Search brought me to your post. Although I’m not sports minded, I find it fascinating to read about others search for meaning. I mean, really, anyone who has the courage to search for their meaning of life gets my vote! As my simple way of giving back and of saying “way to go!”,I’d like to offer you (and all who read this) a gift copy (pdf) of my book, No Experts Needed: The Meaning of Life According to You! My story demonstrates how you can add meaning to every day of your life simply by talking to the person sitting next to you.